An exhilarating new fragrance that stimulates the senses. 1 Million Lucky is a woody scent with an addictive hazelnut base, topped with a shot of plum and a nutty bite finale. One inhale and the world is yours for the taking! Built around a gourmand hazelnut, a contrast of shifting sensations. About the Brand: If there is one brand in the world that can truly pride itself in being audacious and avant-garde, it is certainly Paco Rabanne. From fashion cut out of metal to perfumes that break all the established codes, Paco Rabanne has always innovated, creating novelty to provoke the strongest of emotions. Striking, daring, light-hearted and provocative, Paco Rabanne's fragrances have an exceptional power to leave a strong impression on everyone's memories and become cultural benchmarks. Explore the entire range of Perfumes (EDT & EDP) available on Nykaa. 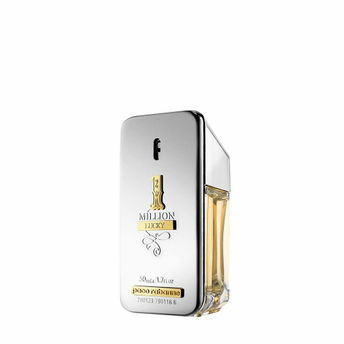 Shop more Paco Rabanne products here.You can browse through the complete world of Paco Rabanne Perfumes (EDT & EDP) .Alternatively, you can also find many more products from the Paco Rabanne 1 Million Lucky Eau de Toilette range.